Sao Paulo, Brazil (CNN) -- It's party time for those who like dancing and music -- and the beautiful game. Brazil, the host nation of the 2014 World Cup and famous for its flamboyant carnival culture, is one of the most important countries for South Africa, which in June becomes the first country of its continent to stage soccer's showpiece tournament. A South African delegation arrived in Sao Paulo recently to let people in this football-crazy nation know that the 2010 host is ready. "Absolutely! I think it's beyond that question now," says Yusuf Omar, Consul General of South Africa in Sao Paulo. "The question now is the depth of our legacy, the depth of the identity of the World Cup, to what extent we realize this African World Cup." Ahead of the June 11 kick-off, the South African organizers wanted to introduce Brazilians in Sao Paulo to Zakumi, the official mascot for the event -- a furry, yellow creature with green hair (the colors of both nations' soccer teams). Video: A World Cup with empty seats? Video: Has FIFA gone too far? Zakumi is a hybrid between a human and a leopard with a very symbolic name. "ZA" is the international code for South Africa and "kumi" translates into "10" in several African languages. The visiting delegation also brought along former South African football star Lucas Radebe. "I feel very honored. For us it's a dream come true," he said. The organizers also introduced the musical theme of South Africa 2010, with a dance ensemble showing the media who attended the event some of the moves that will be popular during the month-long tournament. It was hard to resist the music and the rhythm, even for reporters. 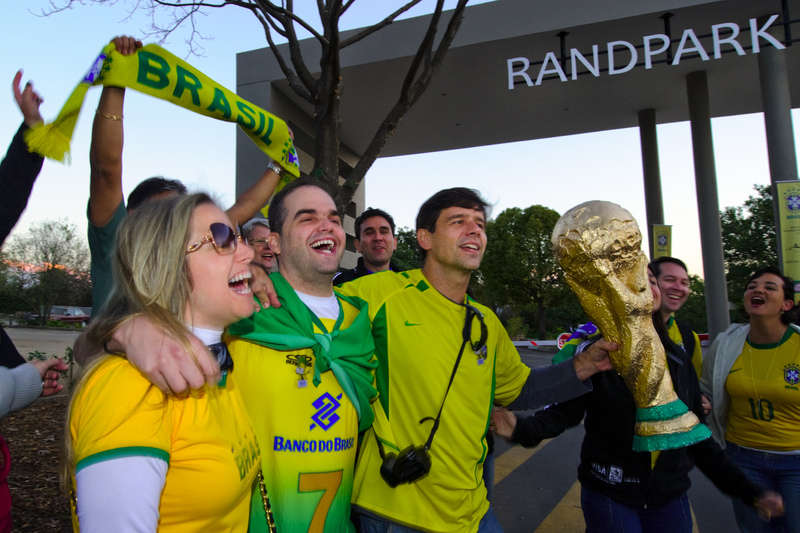 The excitement building up ahead of the tournament's launch in Johannesburg can already be felt on Brazilian streets. At Ibirapuera Park in Sao Paulo, football fans were already talking about their high expectations for their national team. 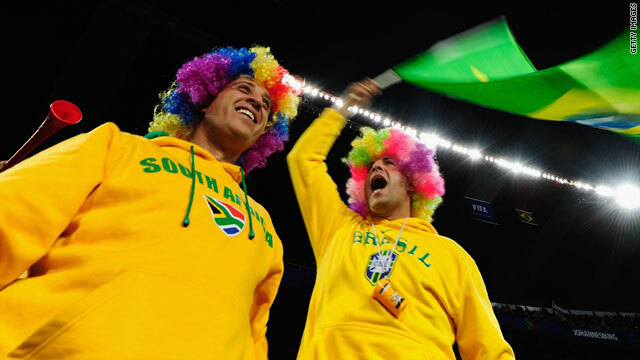 As many as 30,000 Brazilians will travel to South Africa to watch the games, according to organizers. One supporter, Michel Eduardo Pereira, screamed the word "logico" ("of course!") when asked if he thinks Brazilian can win the World Cup this time around and even down the line in four years. Brazilians will be paying close attention to South Africa, not only because they're hoping their team will win another title, but also to learn lessons ahead of 2014. Stadiums like Morumbi in Sao Paulo are already on a list of possible sites for the opening game. To witness the level of passion Brazilians have for football, we attended a match in Sao Paulo between Corinthians and Paulista, two of the most popular teams in the region, at the Arena Barueri. For the duration of the game, a drums corps played nonstop to excited fans who jumped and chanted rhythmically, following their team's every move. They didn't even rest during the halftime interval, and this was only a not-so-important game during regular season. For Brazilians, the sport known here as "futebol" is much more than just a national pastime. It also gives them a sense of identity and national pride. No other country can say that their national team has won the World Cup five times. And fans like Dante Casarotti are not shy when it comes to letting the world know about their team's accomplishments. Casarotti proudly showed me a yellow shirt with green letters that say, "I have just five, and you?" -- referring to the number of times Brazil's "Samba Kings" have been world champions. "We made this shirt in Germany for 2006. I think it's very provocative," says Casarotti. He assures me that most fans do not take offense -- in fact, most want to take pictures with him because of the shirt. Casarotti is one of four friends who traveled to Europe four years ago and are now pooling their money to travel across the Atlantic to South Africa. "We thought we would spend $6,000-7,000 for the first stage of the World Cup, the first three games, but now we got a better price from $3,000-4,000 for the first few days in South Africa," says Ricardo Fiorotti, another of the quartet. They're already practicing the song they plan to sing to the world in South Africa, a song that talks about samba, football, and a "happy country." It's evident that for fans like these, the World Cup has already begun.